Happy Death is a project about our fears of the unknown. Many of us feel uncomfortable speaking to strangers in the streets. Therefore I created this project, which relies entirely on the spontaneity and generosity of random people I meet in the streets. First time staged in Vienna, a city I had never visited before, nor knew anyone, I dressed in a uniform to take on the appearance of a functionary working for an official organization. I would walk around and approach strangers and ask them to participate in my project by donating a piece of personal clothing and tell me the story of the garment's significance. For this I would visit the donors at an agreed time at their homes or offices. 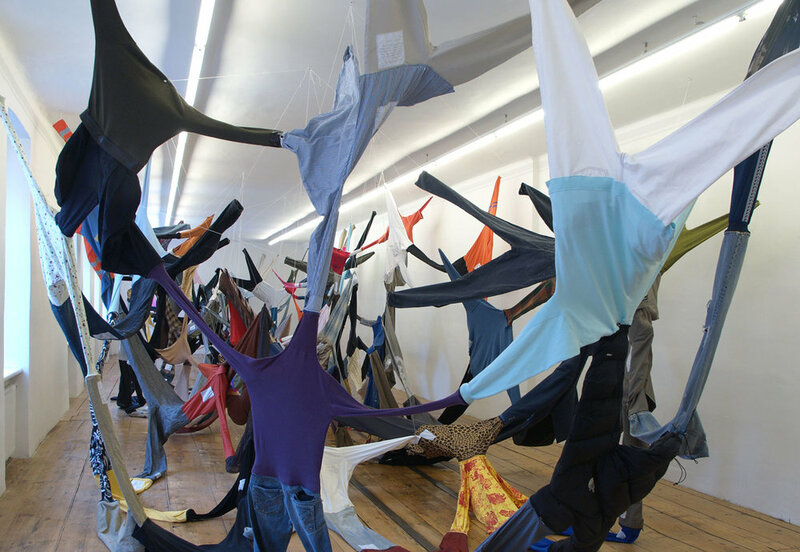 These collected garments were then sewn together to create a big web-like installation. Would you give me a piece of your old self? During one month the agent of Happy Death walks through the city of Vienna looking for people to invite her to their homes and offices and donate a piece of clothing with a story for the society web she is about to build. Most people she approaches randomly on the streets and others she meets in museums, gallery openings, restaurants and bars. Many donors end up referring her to their friends and family members. The society web grows fast! Every garment is labelled with the name of the donor and the story of the piece. Hans Werner Poschauko: Orange shirt, too small. This shirt was once even used as a flag. At the occasion of the government overthrow was this shirt attached to a long pole. The installation created from the collected garments illustrates the society web we're all part of. Also, it resembles the synapsis configurations in our brains. The comparison refers to our theoretical constructs in our brains about people and their significance in relation to ourselves and each other. The psychological shields behind which we hide to make life feel safer and to feel less vulnerable are mechanisms we find in all aspects of society. For an artist who likes to create my work in the privacy of my studio "Happy Death" was a true challenge and an opportunity to test new waters. Through this three part art piece in which sculpture, performance and the unpredictable work of soliciting in the streets are combined, I experienced new possibilities of creating. Creating a piece of art entirely dependent on the help of random people I meet in the streets and seeing where the exchanges take me to was a life changing experience! As it is a bit frightening to embark on such a project, I learned that relinquishing control and abandoning my preconceptions about people was the key to success. Letting oneself fall into this unknown space feels a bit like a little death. Abandoning a set self image to make space for getting reacquainted with the world around us and also parts of ourselves we didn't know feels liberating! In the performance part of "Happy Death" I am demonstrating the transformation and liberation of an individual who is helplessly lost in the craziness of her tirelessly blabbering head. As she accidentally knocks over a bell during her wild ranting, she awakes and realizes her delusions. This is the moment of a happy death for her, as she lets go of her inner voices and wakes up to the spontaneous experience of the undefined fresh moment of being alive.